Using a sample of university students (n=362), the present research aims to:1) investigate the factors affecting one’s sense of community (SOC), 2) study the impact of SOC on life satisfaction, and 3) add a new aspect to SOC based on a valuedbased model. Our measure of SOC is based on the scale created by Obst et al. with an added dimension–sense of responsibilitybased on Nowell and Boyed’s model. An Amos model was used to confirm the meaningfulness of the added dimension (sense of responsibility). The analysis includes multiple self-constructed measures, including Satisfaction with the University, Social Participation, Social Trust, Sense of Gender Equality, Openness of University, Hope in the Future, and Sense of Competition, while Extroversion is measured using the revised NEO scale. Life Satisfaction is measured using the scale developed by Diener et al. The results indicate a positive and direct relationship between Satisfaction with the University, Extroversion, Social Trust, and Openness of University. We conclude that the most influential factor on SOC is Satisfaction with the University. Moreover, the research findings provide additional support forth positive impact of SOC on life satisfaction. Sarason  considered sense of isolation and anomie as major problems in modern society and introduced “psychological sense of community” as a pivotal construct in this field. Moreover, Nisbet  highlights the problems of modern society, especially middle-class society, including the alienated, the disenchanted, and the rootless and neurotic people. Authors such as Boyer  describe this problem as “the loss of community”. Sense of Community, or SOC, indicates how individuals are connected to their community, and it has been found to play a major role in reducing social and individual problems. Identifying the determinants of SOC in a university campus setting could not only reduce sense of isolation felt by university students, but also could increase their satisfaction with university programs and promote their motivation for learning. So the present article considers SOC as a major social construct in university setting. University is chosen as an environment that develops and promotes SOC of students. Since students pass most of the time in the university, it is a place which they develop a sense of belonging and also the feel a sense of responsibility towards the university in which the study. In other words the present article presumes that university is not only a place for meeting the needs, but also the students develop a sense of responsibility towards it. So the value-based perspective is considered instead of need-based model to assess the sense of responsibility of students. Based on our searches about SOC value-based model of SOC has been rarely studied and measured. However, there has been little discussion about factors that influence SOC specifically in university setting. So the present article seeks to investigate the most relates social and environmental factors that affect SOC. Although we have categorized these independent factor but related. For example space of university may promote hope in future of the students. This article has two main goals: it will attempt to investigate the correlates of SOC and also consider a new dimension – Sense of Responsibility – for measuring SOC. Some researchers have identified factors affecting SOC  and others have focused on its outcomes,  but the present research considers three kinds of factors affecting SOC: social, individual-level and specific characteristics of the environment. We consider social factors such as Participation, Social Trust, and Satisfaction with the University, as well as Extroversion as an individual-level factor. We also include characteristics of the environment such as Open Space of University, Sense of Gender Inequality, Hope in the Future, and Sense of Competition among University Students in the analysis. The specific factors of the university environment were determined based on 15 structured interviews with students. Students were asked to identify which characteristics of the university increase or decrease their SOC in the university; four factors (Open Space of University, Sense of Gender Inequality, Hope in the Future, and Sense of Competition) were selected based on these interviews. In addition to these independent factors, an outcome – Life Satisfaction – was also considered. So in this article have reviewed the literature of SOC and selected the independent factors which are the most related to university setting and also to consider the specific features of the university, we conducted interviews and then based on the responses of interviewees, the specific characteristics are chosen. So we can say that the major problems which are addressed in the present study are: how is SOC in a university setting? What are the main factors that influence SOC of students? What are the specific factors related to environment that affect SOC and to what extent these SOC is explained by these independent variables? Is satisfaction with life the outcome of SOC? Psychological Sense of Community is a fundamental concept in community literature, described by Sarason  as an “overarching value” of the field. Sarason  defined SOC as “the perception of similarity to others, and acknowledged interdependence with others, a willingness to maintain this interdependence a feeling that one is part of a larger dependable and stable structure”. Although the concept of SOC has been empirically studied in various community settings, including college environments , community organizations  campus workplaces, classroom community , local neighborhoods [10-12] and university settings [13-16], there is no universally-accepted operationalization of SOC. According to Hill , various measures and dimensions of SOC used by researchers are created based on one of two approaches: a factor analysis approach or a theoretical one. The use of factor analysis is more widespread, but the fourdimensional framework of McMillan and Chavis  is a notable exception. The integrative theoretical framework which McMillan and Chavis  proposed has four dimensions:1) membership, 2) influence, 3) needs fulfillment and 4) shared emotional connections. Membership refers to the feeling of belonging, feeling of being part of a community, and emotional safety based on a shared history and common symbols. Influence is the reciprocal relationship between individual and community; an individual has a perceived influence over the decision and actions of the community and the community also has influence over individual membership. Fulfillment of needs reflect the idea that people’s needs are met through their membership in the group or community. The fourth and final component of the model is shared emotional connections, which refer to the bonds developed over time through positive interaction with other community members based on similar experiences, significant events, and common places. We propose a value-based perspective of PSOC in which one's sense of community is rooted in a sense of responsibility for the community that may exist independent of any expectation of needs fulfillment” . A double-loop learning model is a model in which researchers critically examine the initial models and propose a new model in which they consider a new dimension and advance the theoretical literature of SOC. Nowell and Boyd  focused on the measurement of this concept and then proposed Sense of Responsibility as a new aspect for SOC. They consider the limitations of the human needs perspective, which views the community as a recourse that meets the member’s needs, and propose a value-based approach of SOC in which one connects to their community because they feels responsibility toward it and does not do it for meeting their own needs. This analysis provides support for Nowell and Boyd’s  theoretical extension, and the following Amos models shows that Sense of Responsibility can be an aspect of SOC because all model indices are higher than expected. There is enough evidence which approved the need-based model but the value-based model has not been considered by various researchers in the literature. The novelty of our research is measuring this new aspect and supporting it using AMOS software; this feature distinguishes this study from previous researches that measured SOC because SOC was always measured using the four dimension of membership, support, influence, and belonging. Neither Sarason  nor McMillan et al. specified a particular kind of community to which their theories applied, and it is our assertion that the concepts of SOC applies to both communities that are placed-based (e.g., local neighborhood, town and city) and interest-based communities (e.g., virtual communities, professional groups). The present research assesses SOC in a university setting, which is simultaneously a community of place and a community of interest. Moreover, the novelty of this research is operationalizing “sense of responsibility” as a new dimension of SOC. The predicting factors of Sense of Community have not been explored sufficiently. Some empirical research has been done in this area, and various researchers had considered participation as an influential factor in predicting SOC [8,14,15] . McAdam  argued that active participation in one’s community will both meet the needs of community members and strengthen their sense of belonging. Chavis and Wandersman  considered SOC as a catalyst for enhancing social participation, which in turn results in community development. Hughey et al. have investigated the relationships between “community organization sense of community” (COSOC) and factors such as political participation, community involvement, and perceived neighborhood safety. Obst et al. suggested that having children and participation in community organization will enhance SOC. Cheng  had investigated the sense of campus community in the university setting and distinguished three sets of independent variables, including demographic (e.g., gender, ethnicity, and family income), academic (e.g., college affiliation, class level, and academic achievement), and social characteristics (e.g., students’ self-reported participation or involvement in campus activities). According to Cicognani et al. , opportunities for social participation reinforce one’s Sense of Community, and SOC has promising outcomes, such as social well-being. They argued that social participation has been an important construct in scientific literature in the past because it provides the opportunity for establishing social relationship with other members of the community. Additionally, participation in one’s community increases social responsibility, which is part of the SOC construct [14,21]. Furthermore, this research aims to investigate the relationship between SOC and social trust. Sense of trust is an important characteristic of any community and it is also a main element of social capital. They distinguished two kinds of community: Gemeinschaftand Gesellschaft. Gemeinschaft is used to describe small communities in which there are close social relationships between community members that are based on trust. In contrast, Gesellschaft is a kind of community in which social relations are based on contract . Therefore, trust is an important element in establishing close social relations between people and enhancing their SOC and sense of belonging. Mahan et al. have studied the impact of interpersonal trust on SOC in a university workplace. They concluded that trust is a related but distinct construct from SOC. They have investigated SOC in five work settings, including the university, the school, the department, the research center, and the research group. Their findings show that people in small groups have more SOC because they have more opportunities to influence larger organization and cultivate more close social relationships. According to Haines  , trust, social relationships, and common values bond community members together and lead to augmenting their sense of belonging and feeling of being part of community. Jenny et al. specified three main features for social capital, including the relationship between individuals and groups, reciprocity, and trust. According to Woolcock and Narayan  characteristics such as trust increase the reciprocal relationships between members and leads to higher social capital. It can be concluded that interpersonal trust increases reciprocal relationships, which in turn increase sense of belonging and SOC. Glynn  also found a significant relationship between SOC and community satisfaction. As noted earlier, in this research, we considered three main categories of independent variables which affect SOC: social, individual-level, and factors which are specific to the university environment. Many authors agree that SOC is affected by specific environmental characteristics. To identify these characteristics, we interviewed 15 students who were asked to answer open-ended questions regarding factors that increased or decreased their SOC. Based on their answers, four factors–Openness of University, Sense of Gender Inequality, Hope in the Future and Sense of Competition–were selected due to their repetition among respondent answers. Sense of Gender Inequality was mentioned by girls who believed that boys have more freedom and rights in the university and it decrease their SOC. Furthermore, students reported that Openness of University attract them to participate in different activities. If they feel that the university calls for and accept their opinion, they will speak their voice; if they feel that they can easily have political and social discussion in the class, they would trust and freely organize such meetings in the university. Hope in the Future measures student hope that what they learn in the university will help them to find an appropriate job or what they learn in the university is consistent with the society needs. The final factor – Sense of Competition – is based on reports that competition among students decreases their SOC. For example, students mentioned in their interviews that their classmates conceal the fact that they are preparing themselves for the upper-level examination. We include a measure of Extroversion as an individual-level control. In line with Lounsbury and DeNeui , we chose Extroversion because it is a personality trait which embraces social features such as talkativeness, interpersonal warmth, and social assertiveness, and it is related to SOC because it also involves with interactions among members of a community and their reciprocal relationship and influence. Extroverted people engage more with their environment and feel free to participate and thus they feel more SOC than introverted people and they feel they belong to the university as a community. In this article, we consider Extroversion as an independent variable and hypothesize it is positively correlated with SOC. The results of various researchers suggest that SOC is related to a variety of positive outcomes. According to Cicognani et al. , social participation and sense of community have positive impacts on social well-being. Existing literature suggests that SOC correlates with various indicators of well-being, such as life satisfaction . These findings suggest that community members who have a greater SOC will have a greater sense of belonging and feel like a member of a community, which leads to greater life satisfaction. Chives and Wanders man  argue that people who have a greater sense of community will have more positive evaluations of their community and greater satisfaction with their environment. According to author, SOC is significantly related to subjective reports of well-being. This study aims to investigate the impact of independent factors such as Satisfaction with the University, Social Trust, Social Participation, Openness of University, Sense of Gender Inequality, Hope in the Future, Extroversion, Sense of Competition on SOC, as well as explore the effect of SOC on life satisfaction. Moreover, we contribute to the development of a theoretical framework of SOC by adding a new dimension–Sense of Responsibility–to the measurement model. We also investigated the impact of demographic variables such as age, gender, living in the campus, and length of attendance in the university on SOC. • There will be a positive correlation between Satisfaction with the University and SOC. • There will be a positive correlation between Social Trust and SOC. • There will be a positive correlation between Social Participation and SOC. • There will be a positive correlation between feeling Openness of University and SOC. • There will be a negative correlation between Sense of Gender Inequality and SOC. • There will be a positive correlation between Hope in the Future and SOC. • There will be a negative correlation between Sense of Competition and SOC. • There will be a positive correlation between Extroversion and SOC. • There will be a positive correlation between SOC and Life Satisfaction. The analysis was carried out on a sample of university students in Isfahan, Iran, comprised of 362 participants. Isfahan University is one of the main universities in Iran, and has almost 12,520 students. The sample size was determined using Cochran theorem, which produced an ideal sample size of 372. The questionnaires were distributed among randomly chosen participants based on stratified random sampling. The sample was selected based on criteria such as degree/ program (undergraduate, graduate and PhD students) and the different colleges (there are 10 colleges in this university). However,10 students did not complete the questionnaire in-full, and their responses were dropped from the analysis. The final response rate was 97.3%. Questionnaire is the main instrument for collecting data in the present research which is distributes among randomly selected respondents. The questions are measured using a five-point Likert scale. In the following we review the structure of the questionnaire and also the five dimensions of dependent variable and also the independent variables. The questionnaire has two main components; the first includes the main questions, designed based on the hypotheses, and the second includes demographic questions (e.g., gender, age, level of education, length of attendance in the university, and living on campus). The questionnaire was completed anonymously after obtaining consent of participants, and respondents spent almost 30 minutes to complete the questionnaire. This concept was operationalized by using four subscales measuring four different dimension of PSOC specified in the factor analysis of Obst et al. ; the “conscious identification” aspect was omitted because we aimed to measure SOC based on MacMillan et al.’s  model and also an added dimension –Sense of Responsibility. The wording of the items in the original scale was modified to replace “neighborhood” or “group” with “campus community.” Some items were omitted because there was conceptual and measurement overlaps between the items and the independent variables in the study. Also, as the original scale items were written in English, and some English words do not have appropriate equivalents in Persian, we dropped the items for which the translations did not make sense. This dimension dealing with emotional ties and friendship within the community, was measured using 11 items (e.g., “If I need a little company, I can contact one of my friends in the university,” “I feel a strong sense of ties with my friends in the university,” “We have a lot of opportunity to establish friendly relationship in our university”) using a five-point Likert scale, ranging from1=strongly disagree to 5=strongly agree. Internal consistency of the scale is high (α=0.89). The second dimension included 5 items, similar to McMillan et al.’s  concept of “Fulfillment of Needs,” which indicated the idea that the needs of the members will be met within the community (e.g., “I feel quite safe in the university,” “If there was a serious problem in our university, students could get together and solve it”) on a similar fivepoint Likert scale (1=strongly disagree, 5=strongly agree). The Cronbach alpha coefficient indicates a good level of internal consistency (α=0.74). The third dimension consists of 3 items, and indicates the reciprocal relationship between individual and community and their impact on each other (e.g., “I have almost no influence over the educational process of our class,” “I care about how my friends think about me,” “I care about what my friend say about my behavior in the university”) using the same five-point Likert scale as previous dimensions. The Cronbach alpha of the scale is acceptable (α=0.64). The first item –“I have almost no influence over the educational process of our class” – was recoded, but its factor weight was very low (0.10), so it was omitted from the final analysis. This dimension was assessed using 10 items dealing with being part of or belongs to the community, and it corresponds to McMillan et al. notion of membership (e.g., “It is important to me to study here in this university,” “I feel good when I think about being a student of this university,” “As compared to other universities, our university has many advantages”). Similar to other dimensions, it was measured on a five-point Likert scale. The Cronbach alpha indicates an excellent level of internal consistency (α=0.90). This dimension is measured by a 7-item self-constructed scale, and includes items such as satisfaction with method of teaching, major of study, the quality of green environment of the university, library, university environment, university transportation and sports facilities. Its alpha coefficient is 0.73. This dimension is assessed using a list of seven items that measure students’ sense of trust in their friends in the university. Of these items, four were originally developed by Aghajani  and three items were adopted from trust scale of Amirkafi  , which is culturally close to Iranian society (e.g., “My friends never tell lie to me,” “I never speak about my personal and familial problems with my friends”). Obtained Cronbach alpha is good (α=0.67). A self-constructed scale including seven items was used to measure this concept, measuring the level of involvement of students in cultural programs, council elections of the university, membership in volunteer associations (such as scientific associations of university), visiting book exhibitions held in the university, and demanding information about everyday events of the university using five-point alternative responses; its alpha coefficient is relatively high (α=0.83). The life satisfaction scale by Diener et al. was used to measure this concept. This scale included five items on a 5- point scale from 1=strongly disagree to 5=strongly agree. We contend that life satisfaction will be a positively correlated outcome of SOC. Cronbach alpha is nearly high (α=0.87). This concept was measured using a self-constructed scale including five items on a 5-point scale from 1=strongly disagree to 5=strongly agree. For example: “I feel that the space of university is comfortable that students can freely say their opinions,” “I feel free to express my opinion about political and social issues in the class,” “If my friends tell their political views, I will also talk about my views.” Cronbach alpha is almost high (α=0.78). This factor was also measure using a self-constructed scale which includes four items such as “I think the boys feel much more freedom in the university than girls, “I think boys have more opportunity to express their objection”, “The professors behave equally regardless of gender differences.” Cronbach alpha is acceptable (α=0.59). This dimension was measure by self-constructed scale including four items such as “My major in the university is consistent with the needs of society” and “I feel what I learn in the university does not help me in finding a job in future”. Cronbach alpha is nearly high (α=0.77). This factor was measure by a self-constructed scale which consists of three items such as “I think there is a strong competition among students, which leads to the decline of SOC” and “Classmates usually conceal that they are preparing themselves for the exams.” Cronbach alpha is approximately high (α=0.70). This construct which measure an aspect of psychological traits was measured using “Revised NEO Personality Inventory” which is comprised of items such as “I really enjoy talking with my friends in the university” and “I am a very active person.” The wording was modified to be consistent with the university setting. Cronbach alpha is good (α=0.75). Table 2 provides four sequential models to examine the effect of influential factors on SOC. The regression result shows that the most influential factor is Satisfaction with the University, which enters in the first model, and the final model includes factors such as Satisfaction with the University, Extroversion, Social Trust, and Openness of University. Table 2: Regression on SOC. bPredictors:(Constant), satisfaction with university, extroversion. cPredictors:(Constant), satisfaction with university, extroversion, social trust. dPredictors:(Constant), satisfaction with university, extroversion, social trust, space. We found a positive relationship between Satisfaction with the University and SOC. Satisfaction with the University is the strongest among all independent variables. In other words, students who have more Life Satisfaction (B=0.32, Beta=0.36, P>0.01) would be predicted to have greater SOC; this finding provides support for H1. Moreover, the regression result shows that Extroversion (Beta=0.27), Social Trust (Beta=0.22), and Openness of University (Beta=0.16) are factors which explain the dependent variable–SOC. Two demographic variables (Age and Length of Attendance in the University) were included in the model; contrary to expected, we found a negative relationship between Length of Attendance in the University and SOC (B=-0.03, Beta=0.01, P>0.01). Age had no significant effect on SOC and it was excluded from further regression models. The overall results demonstrate that 66% of the total variance in the reported levels of SOC was accounted for by independent variables such as Satisfaction with the University, Extroversion, Social Trust, and Openness of University. We can conclude based on these findings that a mixed model–which considers social, individual-level, and environmental factors–may be an appropriate model to explain the dependent variable. Another hypothesis of this research was the positive correlation between SOC and Life Satisfaction. A regression analysis was done to investigate this hypothesis and the result supported our hypothesis that SOC positively affects Life Satisfaction (B=0.69, Beta=0.44, P>0.01, R-square: 0.20). Table 3 shows the coefficients of each model. As we can see in the table in the fourth model, Beta coefficient of four independent variables is reported: (satisfaction with university: 0.364, extroversion: 0.277, social trust: 0.222, space of the university: 0.168). Based on this regression model we may conclude that satisfaction with university is the most influential factor of SOC. Table 3: Coefficients of regression model. To investigate the effect of two other demographic variables – Gender and Living on Campus – independent samples T-test were computed. The results indicated there were no significant differences in levels of SOC according to gender. We expected students who live on campus to have more SOC than students who live off-campus, but, contrary to our expectation, the result of the T-test showed that off-campus students reported greater levels of SOC than on-campus students (Table 4). This may be due to a sense of loneliness from living on-campus and/or from living far from one’s family. Table 4: The result of T-test. Hypothesis 5 predicts a positive association between SOC and Life Satisfaction. Table 5 presents the result of the regression analysis predicting Life Satisfaction. As expected, SOC was positively related to Life Satisfaction (B=0.72, Beta=0.45, P>0.01). Based on the regression analysis, we can conclude that students with greater SOC will also report higher levels of Life Satisfaction. As mentioned earlier, in this article we added a new dimension of SOC to its measurement which was based on the value-based model. Because university is a setting in which individual foster a sense of responsibility. Then it should be addressed whether this new dimension fits the overall SOC scale. AMOS is used to examine this probability. 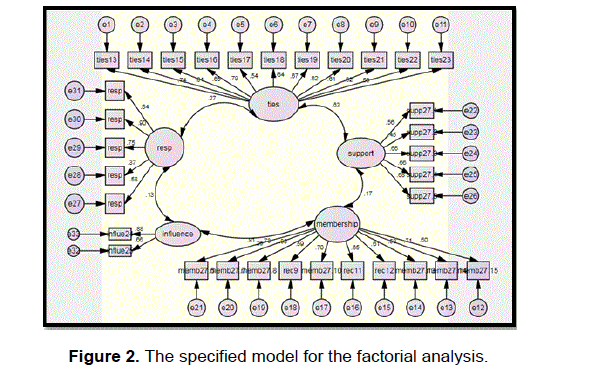 So in this analysis, we used structural equation modeling for factorial validity. As Figure 2 shows, when Sense of Responsibility is added to the other dimensions, the model fit indices are highly acceptable for this model. So we may regard this new dimension a valid aspect of the SOC scale. Figure 2: The specified model for the factorial analysis. As Table 6 shows the normed chi-square is 3.24, which it is less than 5 as we expect. The Comparative Fit Indices are under 0.90 (CFI=0.80, TLI=0.79), which indicates the specified model is far from an independent model or saturated one. Parsimonious Fit Indices are greater than 0.5, which signify the presence of strong, free parameters in the model (PNFI=0.64, PCFI=0.69). The RMSEA Index is less than the cut point of 0.08, which generally supports the specified model. In general, it can be concluded that, based on these data, this factorial model is confirmed and empirically supported. Table 6: Fit indices for the specific model. The present research investigated the effect of three main categories (social, individual, and environmental) of independent factors on SOC. Our research has two main aims:1) exploring the effect of these independent variables (Social Participation, Social Trust, Satisfaction with University, Openness of University, Sense of Gender Inequality, Sense of Competition, Hope in the Future, and Extroversion) on sense of community, and 2) the impact of Sense of Community (SOC) on Life Satisfaction. Regression analyses shows that, among these eight factors which we hypothesized affect SOC, four factors (Satisfaction with the University, Openness of University, Extroversion, and Social Trust) affect SOC; others were excluded from the model. The results of the study provide support for the positive relationship between University Satisfaction and SOC, and the regression results show that this is the most influential factor in explaining the dependent variable (SOC). Students who are more satisfied with the university also exhibit greater SOC. This outcome support the results of similar studies [13,30,31] which show that a relationship exist between student satisfaction and their SOC on campus. Prezza and Costantini  have also studied the relationship between SOC and Life Satisfaction in three communities and found that SOC relates to Life Satisfaction in town and small cities. According to Chavis and Wandersman  there is a reciprocal relationship between SOC and satisfaction with the environment. They believe that individuals who have a strong SOC will have a more positive perception of their environment, such that their satisfaction with the environment increases. Glynn  also found a relationship between SOC and community satisfaction. As predicted, we also found a positive relationship between SOC and Social Trust. The findings of Beverly et al. show these two variables – Social Trust and SOC – are “two related but distinct constructs” and there is positive relationship between them. It can be concluded that students who have more interpersonal trust would also have more social relationship on-campus, and thus their SOC will be reinforced. One of our hypothesis was that Extroversion (as the only individual-level independent factor) positively influences SOC, which was supported by the regression results. This finding is consistent with Lounsbury and DeNeui ; they also studied SOC in college environment and Extroversion was the most influential factor in explaining SOC. The other factor which had positive influence on SOC was Openness of University- which was one the factors specific to the environment and identified based on interviews with a small group of students. This relationship shows that if students feel that the space of university campus is trustworthy and they can easily express their opinions, they will participate more frequently and will establish more relationships with the other students, and this leads to higher SOC. Finally, SOC positively influences Life Satisfaction. This finding is supported by Cicognani et al. work, in which they show that there is a positive relationship between SOC and subjective well-being; we consider Life Satisfaction to be a component of subjective well-being as measured by Cicognani et al. . Hill  suggests, based on Sarason’s  theories, that forming healthy communities in which there is a SOC at the individual and collective levels will lead to healthy individuals. Students who have a greater SOC would feel more Sense of Belonging and they would cultivate more social relations with other community members, and thus their Life Satisfaction would be enhanced due to their Satisfaction and Belonging with community. Regarding the effect of demographic variables on feelings of SOC, researchers have reported inconsistent results. Unlike Pretty and McCarthy , who found SOC to be an influential factor on SOC, we did not find any differences in the levels of SOC according to gender. Belenky et al. also developed a model in which they conclude that female students have more SOC than male students because they put more emphasis on social relationship and learning in cooperative environment. However, Cheng  found no association between gender and students’ sense of campus community. This study also revealed that length of attendance in university (measured by years spent in university) was inversely related to sense of community. This finding is in line with the results of Lounsbury and DeNeuis , in which they found SOC is significantly higher for freshmen students. In addition, Cheng  argues that SOC is higher among first-year students and it declines as they become juniors. In contrast, Rovai et al. have reported that graduate students have higher levels of sense of connectedness than undergraduate students. The other significant contribution of this research is studying the role of living on-campus for SOC. Contrary to our expectations; SOC was significantly lower among students who lived on-campus than students who lived off-campus. Presumably, students who live on-campus experience more loneliness, or living far from their families is difficult for them, which leads to lower SOC. Contrary to our findings, Lounsbury and DeNeuis  reported living on-campus as an augmenting factor in different levels of SOC. Future research should investigate the underlying causes of lower SOC in on-campus student populations. Finally, data analysis revealed no differences in the levels of SOC according to age, and it was excluded from regression model as an independent variable. The mixed results regarding demographic variables suggest that specific characteristics of communities influence the level of SOC . In conclusion, this study illustrates correlations between Satisfaction with the University, Social Participation, Social Trust, Openness of University, Extroversion, and SOC. It also provides support for our positive effect of SOC on Life Satisfaction. However, there are some limitations that should be considered and can serve as starting points for future research. One limitation of this study is that we use quantitative method for gathering data, which does not provide in-depth knowledge. For example, we cannot infer from the results why SOC is lower among students who live on-campus, unless we use qualitative methods. This is an empirical question which should be examined in the future. This research provides an empirical assessment of a new component of SOC by operationalizing sense of responsibility and assessing it using AMOS. Further research is required to investigate the relationship between this concept and the dimensions of the SOC scale in differs samples. Finally, the sample of the present article is limited to one university. In the future, other sample sites could be used for investigating the influential factors of SOC. Sarason S. The psychological sense of community: Prospects for a community psychology. San Francisco:Jossey-Bass.1974. Nisbet R. The quest for community. New York. Oxford University Press. 1953. Boyer E. Campus life:In search of community. A special report of the Carnegie Foundation for the advancement of teaching. Princeton. NJ:Princeton University Press. 1990. Rovai AP. Sense of community. perceived cognitive learning, and persistence in asynchronous learning networks. Internet High Educ. 2002;5:319-2. Chavis DM and Wandersman, A. Sense of community in the urban environment: A catalyst for participation and community development. Am J Community Psychol,1990;18:55-81. Pretty GH, et al. Sense of community and its relevance to adolescents of all ages. J Community Psychol. 1996;24:365–380. Lounsbury JW and DeNeui, D. Collegiate psychological sense of community in relation to size of college/ university and extroversion. J Community Psychol. 1996;24:381-94. Hughes J, et al. Sense of community in community organization: structure and evidence of validity. J Community Psychol. 1999;27:97-113. Rovai A P. Development of an instrument to measure classroom community. Internet High Educ. 2002; 5:197-211. Nasar JL, et al. The psychological sense of community in the neighborhood. Journal of American Planning Association. 1995;61:178-184. Kingston S. et al Sense of community in neighborhoods: As a multi-level construct. J Community Psychol. 1999;27:681-694. Mannarini T, et al. Image of neighborhood, self-image and sense of community. J Environ Psychol. 2006;26:202-214. Cheng D X. Students’ sense of campus community: what it means, and what to do about it. NASPA J. 2004;41:216-234. Cicognani E, et al. Social participation, sense of community and social well-being: A study on American, Italian and Iranian university students .Soc Indic Res. 2008;89:97-112. Hill J. Psychological sense of community: Suggestions for future research. J Community Psychol. 1996;24:431–438. McMillan DW, et al. Sense of community: A definition and theory. Am J Community Psychol. 1986;14:6-23. Nowell B and Boyd N. Viewing community as responsibility as well as resource: deconstructing the theoretical roots of psychological sense of community. J Community Psychol. 2010;38:828-841. McAdam D. Political process and the development of black insurgency. 1930–1970. Chicago: University of Chicago Press.1982. Obst Patricia L, et al. An Exploration of Sense of Community, Part 3:Dimensions and Predictors of Psychological Sense of Community in Geographical Communities. J Community Psychol. 2001;30:119-133. Smetana JG, et al. Adolescent development in interpersonal andsocietal contexts. Annu Rev Psychol. 2006;57:1–15. Mahan B W, et al. Sense of community in a university setting. Psychological Sense of Community: Research, Applications, and Implications. New York. 2002. Haines A. Asset-based community development. Rout ledge publication. 2009. Jenny O, et al. Measuring social capital in five communities. The journal of Applied Behavioral Science, Sage publication. 2000;36:23-42. Aghajani A. Exploring the relationship between sense of gender inequality and social mobility motivation.2009. (sample: girl students of Isfahan University). Unpublished BA thesis. Isfahan University. Amirkafi M. Social trust and its predictors. Unpublished MA thesis. Shahid Beheshti University of Tehran. 1994. Diener ED, et al. The satisfaction with life scale. J. Pers. Assess. 1985;1:71-75. Rovai AP and Wighting, M. J. Feelings of alienation and community among higher education students in a virtual classroom. Internet High Educ. 2005;8:97-110. Prezza, M, et al. Sense of community and life satisfaction: Investigation in three different territorial contexts. J Community Appl Soc Psychol. 1998;8:181-194. Beverly KK et al. Information Quality Benchmarks: Product and Service Performance. Commun ACM. 2002;45:184-192. Pretty G and McCarthy. M. Exploring psychological sense of community among women and men of the corporation. J Community Psychol. 1991;19:351-361. Belenky M, et al . Women’s ways of knowing. New York: Basic Books. 1986. Rovai AP, et al. School climate: Sense of classroom and school communities in online and on-campus higher education courses. Quarterly Review of Distance Education. 2005;6:361–374.